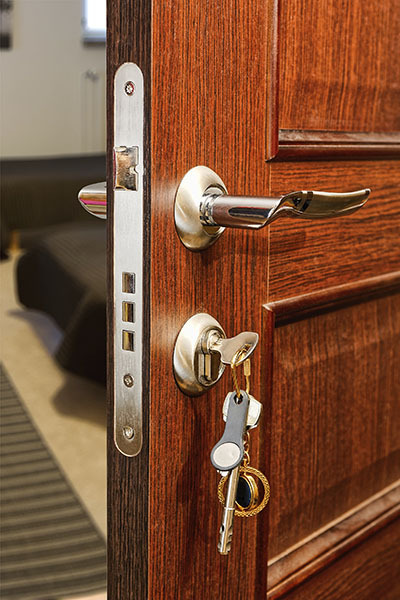 Most modern door locks are made from brass or steel and this makes them particularly strong. In addition, the locking system sits inside the door where it’s well protected from the negative effects of the natural environment to a great extent. Given all this, is there anything you can do to keep your home’s exterior door locks in good condition? The following tips will help you stay out of trouble and enjoy smooth performance now and in the longer term. Often, the way you use an item can help immensely to protect it and this is definitely the case with locks. It’s common for people to be abusive even though they rarely realize it. Have you ever wondered what the right way to use a lock is? It’s always best to have clear visibility of the keyhole so that you can insert the key smoothly. Then turn it gently to the required side, but avoid using force while doing it. Applying pressure on the key’s bow sideways increases the risk of the blade snapping. You would not want to end up with a broken key inside the lock. If the key doesn’t turn smoothly, just jiggle it a bit inside the lock. Another crucial thing is not to push the door open with the key once it’s unlocked. You can hold the key in place, but make sure that you use the door’s handle for opening to avoid putting unnecessary pressure on the locking mechanism and the key itself. It takes just a few minutes to check the condition of door locksets so you can easily do it on your way in, instead of designating a special time for an inspection. Pay attention to the strike plate and ensure that it’s not loose and misaligned. The keyholes and bolts should not have any dents, chips or scratches. The sample applies to the blade of the key too. It has to be perfectly straight. You should also test how the lock and key work by unlocking the door very slowly. If you notice even the smallest sign of damage or strange noise during unlocking, you should opt for lock repair right away. Exterior door locks should be lubed once or preferably twice a year for avoiding dryness and key stickiness. In areas with very cold winter months, lubrication in the fall is mandatory. To get the best possible result, you should clean the lock first, using a can of compressed air. Graphite powder lubricant which is formulated especially for locks is always a top choice. You just need to insert the nozzle into the keyhole and keep lubricating the lock until a small amount of the product comes out. To spread the compound properly, apply a bit on the key blade and turn the key inside the lock several times. This should help to prevent common issues and the need for lock replacement due to wearing and damage early on.